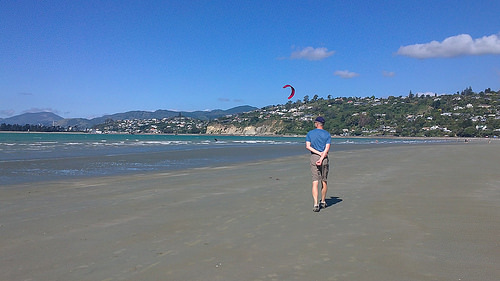 Nelson is one of the sunniest places in New Zealand. Easily one of the Top 10 Destinations in the country. There are many lovely hills around, so you’ll get fantastic views on a day or half day walk. Favourite Nelson day walks are highlights for us, as we live here. And gosh, there are some lovely options! 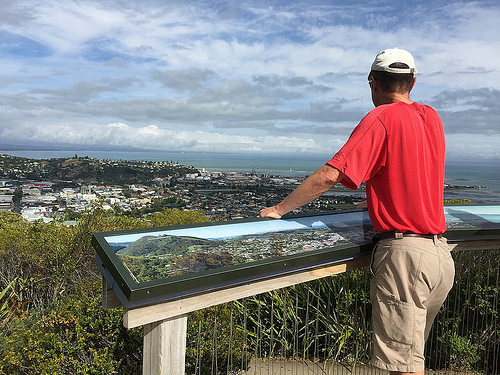 All in all, there are about 56 Nelson walks (see Nelson Council website). But here’s just a few favourite Nelson day walks. There are a couple of entries for this walk that you can choose from. Either walk from the Botanical Gardens Reserve or from opposite Founders Park in Atawhai Drive. Both options are quite steep in parts and I can guarantee they’ll get your heart-rate going. It’s often what you see on the way that really enhances a walk like this. 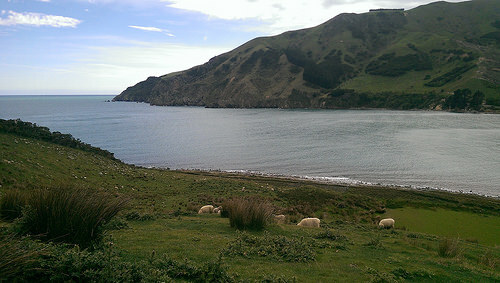 Sheep (and sometimes goats) grazing peacefully alongside. As you draw close to the top of this walk, remember to take the track to the left (the Kauri Track). 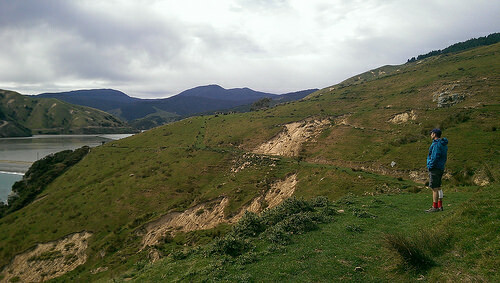 That track will lead to the summit of the Centre of New Zealand. At the summit there is a modern platform built. From here, you can really absorb the landscape. And if you want to take a ‘breather’, you can rest on the seats around the platform. And if you look around, and behind you, well let’s just say, it’s so worth the effort. To the left of you, is the Trafalgar Street Bridge and this is where you can walk alongside the river to Collingwood Street. Turn left, and cross the Collingwood Street Bridge. Turn hard right from the bridge into Shakespeare Walk and follow the river – this is such a great spot for a summer picnic. 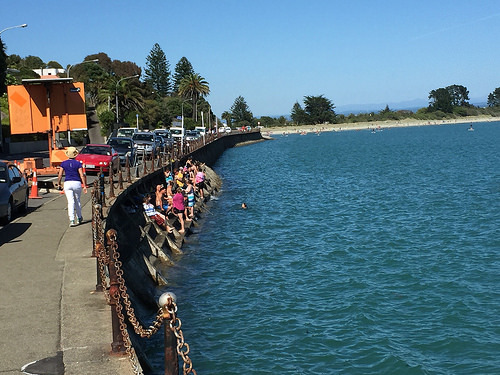 The Nelson Council have kindly provided picnic tables and benches for this very reason. Cross the river again at the Riverside footbridge. Turn left and walk by the Riverside Pool. This is where you follow the beautiful Maitai Walkway. At Bridge Street leave the walkway to cross over the Normanby Bridge. 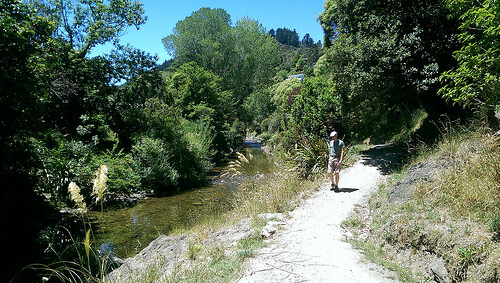 This is a very calming walk with the Matai River gently flowing beside you. Take a stroll along the Maitai River path to Collingwood Street and continue along until you come to the Nile Street Bridge. From then on, an arrow will guide you under the bridge and then up the stairs. Continue the track along to Clouston’s Bridge (on Nile Street). Walk across across the bridge and turn right to Maitai Valley Road. Follow for about 40 metres and turn left at the letterboxes. Follow the track and signposts to the playing field. Go up the track and to the left. You’ll love the native trees – brachyglottis, mahoe, lancewoods, titoki, matai and kahikatea. This beach is very safe and its a great place to spend a few hours just chilling. We usually walk it in the earlier part of the morning, especially summer. This is quite a challenging walk as the track is steep pretty much all the way up. Start at the corner of Brougham and Collingwood streets or from the centre of town walk via Selwyn Place and Collingwood Street. About half way up the street move over to the left and you’ll see an easier route up some steps. At the top of Collingwood Street there is a map of the Grampians – there are numerous tracks to follow and you could spend hours walking all of them. On a clear day, this untouched spot is a very popular with locals and visitors. The beach is beautiful, although it is a stony beach more suited to kayaking. 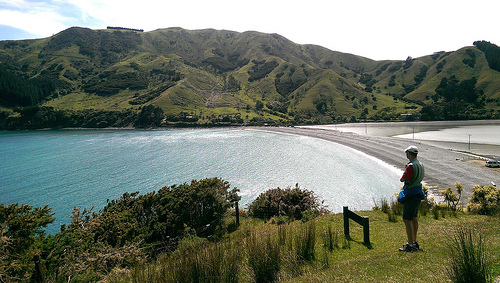 The walkway between the Glen and Cable Bay has wonderful rural views of tussock and a beautiful beach cove. Be warned, parts of this walk are steep steep and sturdy shoes are an absolute must. Some of this is private land with stock grazing so dogs must be left at home. But the rural aspect of this walk is a great attraction for kids who may have never seen a sheep grazing in the open. Remember to use the tiles and not farm gates and stick to the tracks. 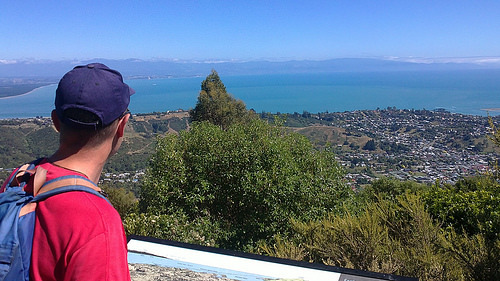 These are our favourite Nelson day walks. 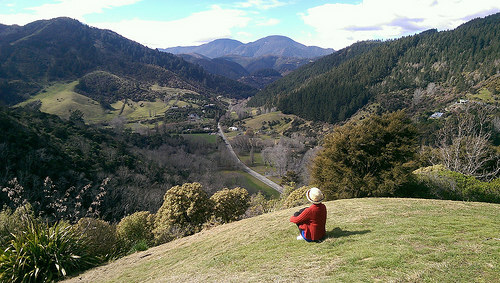 There are so many more to be experienced in the Tasman District. Just gives you an idea as to why we love living in this region. 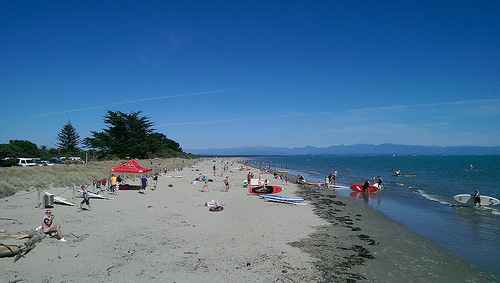 Also you must check out Abel Tasman activity options and especially Abel Tasman Eco Tour and day tours in the nearby Tasman region. Happy Walking our Favourite Nelson Day Walks!